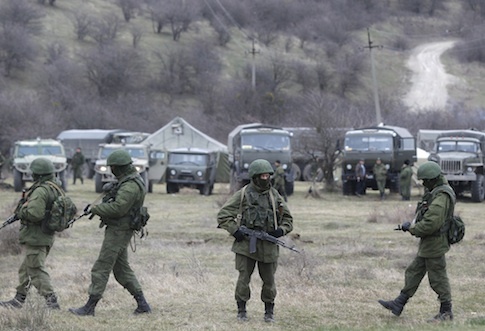 Two Russian soldiers have been detained by Ukrainian security services near the border with Crimea. The Russian Defense Ministry claimed that the two were abducted by the Security Service of Ukraine, or SBU, in Crimea on Sunday. The soldiers were identified as Ensign Maxim Evgenyevich Oditsov and Junior Sergeant Alexander Vyacheslavovich Baranov, the BBC reported Monday. Kiev said that both men defected from the Ukrainian military to Russia after Moscow annexed the Crimean Peninsula from Ukraine in 2014. They had been detained crossing the border at Chonhar, according to Reuters. Russia responded to the arrests by saying that they were "another act of gross provocation" and called for the pair to be returned immediately. The Russians have raised speculation that Ukraine could be subjecting Oditsov and Barnaov to "psychological and physical pressure," although there is no public evidence of this. Since the Russian annexation, tensions have remained high between the two countries. Pro-Russian insurgents in eastern Ukraine have been fighting with Ukrainian authorities since 2014. Russian authorities arrested a number of Ukrainians in Crimea earlier this month and accused them of plotting sabotage against Russia, the BBC noted. A few men were seen confessing to the act on Russian television, although Ukraine has said the accusations are false.